55 FACT BOOK 2015 m ETRO m AGAZINE > bus & chassis manufacturers Turtle Top is known in the automotive industry for quality, service, longevity and integrity. 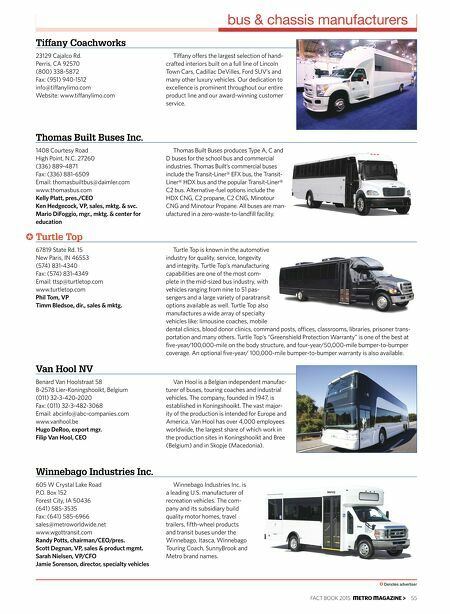 Turtle Top's manufacturing capabilities are one of the most com- plete in the mid-sized bus industry, with vehicles ranging from nine to 51 pas- sengers and a large variety of paratransit options available as well. 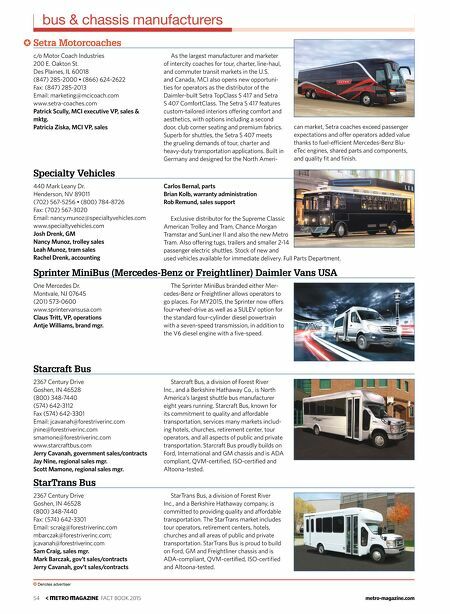 Turtle Top also manufactures a wide array of specialty vehicles like: limousine coaches, mobile dental clinics, blood donor clinics, command posts, ofces, classrooms, libraries, prisoner trans- portation and many others. Turtle Top's "Greenshield Protection Warranty" is one of the best at fve-year/100,000-mile on the body structure, and four-year/50,000-mile bumper-to-bumper coverage. An optional fve-year/ 100,000-mile bumper-to-bumper warranty is also available. Denotes advertiser Turtle Top 67819 State Rd. 15 New Paris, IN 46553 (574) 831-4340 Fax: (574) 831-4349 Email: ttsp@turtletop.com www.turtletop.com Phil Tom, VP Timm Bledsoe, dir., sales & mktg. Winnebago Industries Inc. 605 W Crystal Lake Road P.O. Box 152 Forest City, IA 50436 (641) 585-3535 Fax: (641) 585-6966 sales@metroworldwide.net www.wgottransit.com Randy Potts, chairman/CEO/pres. Scott Degnan, VP, sales & product mgmt. Sarah Nielsen, VP/CFO Jamie Sorenson, director, specialty vehicles Winnebago Industries Inc. is a leading U.S. manufacturer of recreation vehicles. The com- pany and its subsidiary build quality motor homes, travel trailers, ffth-wheel products and transit buses under the Winnebago, Itasca, Winnebago Touring Coach, SunnyBrook and Metro brand names. Van Hool NV Benard Van Hoolstraat 58 B-2578 Lier-Koningshooikt, Belgium (011) 32-3-420-2020 Fax: (011) 32-3-482-3068 Email: abcinfo@abc-companies.com www.vanhool.be Hugo DeRoo, export mgr. Filip Van Hool, CEO Van Hool is a Belgian independent manufac- turer of buses, touring coaches and industrial vehicles. The company, founded in 1947, is established in Koningshooikt. The vast major- ity of the production is intended for Europe and America. Van Hool has over 4,000 employees worldwide, the largest share of which work in the production sites in Koningshooikt and Bree (Belgium) and in Skopje (Macedonia). Thomas Built Buses Inc. 1408 Courtesy Road High Point, N.C. 27260 (336) 889-4871 Fax: (336) 881-6509 Email: thomasbuiltbus@daimler.com www.thomasbus.com Kelly Platt, pres./CEO Ken Hedgecock, VP, sales, mktg. & svc. Mario DiFoggio, mgr., mktg. & center for education Thomas Built Buses produces Type A, C and D buses for the school bus and commercial industries. Thomas Built's commercial buses include the Transit-Liner® EFX bus, the Transit- Liner® HDX bus and the popular Transit-Liner® C2 bus. Alternative-fuel options include the HDX CNG, C2 propane, C2 CNG, Minotour CNG and Minotour Propane. All buses are man- ufactured in a zero-waste-to-landfll facility. Tiffany Coachworks 23129 Cajalco Rd. Perris, CA 92570 (800) 338-5872 Fax: (951) 940-1512 info@tifanylimo.com Website: www.tifanylimo.com Tifany ofers the largest selection of hand- crafted interiors built on a full line of Lincoln Town Cars, Cadillac DeVilles, Ford SUV's and many other luxury vehicles. Our dedication to excellence is prominent throughout our entire product line and our award-winning customer service.